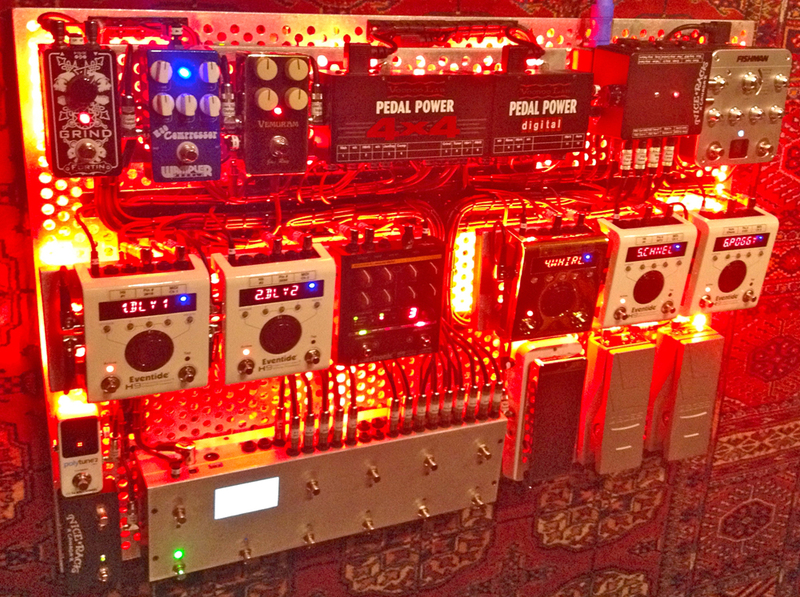 This work of rare art is controlled by the RJM Music MasterMind PBC, serial # 0001. By fully utilizing the MIDI capabilities of the PBC to control the Eventide H9's broad effects palette the system is virtually reconfigurable per preset. To complete the rare quotient of this build, present is 1 of the 99 pieces ever made of the 24kt gold plated H9. 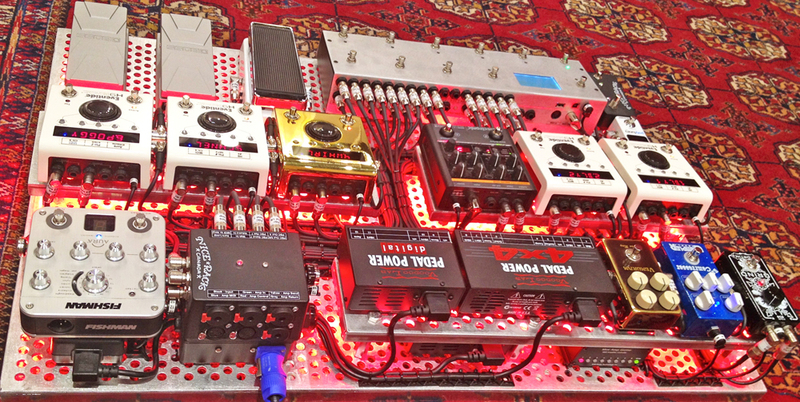 Magnetic Pick Ups --> Xotic Wah --> PBC In 1-4, Loop 1 --> H9 #1, Loop 2 --> H9 #2, Loop 3 -->Vemuran Jan Ray, Loop 4 --> TC Electronic Nova Drive, Loop 5 --> Wampler Ego Compressor, Loop 6 --> Fortin Grind, PBC Out 5-6 --> Amp Input --> Amp Send --> Boss FV30 Volume Pedal --> PBC In 7-10, Loop 7 --> Nice Rack Canada Boost, Loop 8 --> H9 #3, Loop 9 --> H9 #4 --> Out A --> Amplifier Return, Out B --> TC Electronic PolyTune 2 Mini. 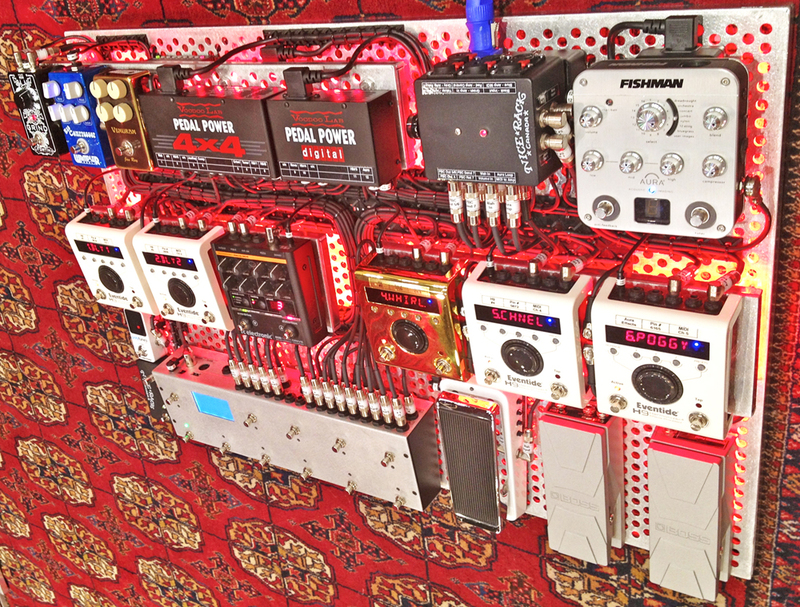 Piezo Pickup --> Fishman Aura DI --> Aura Effects Loop Send --> H9 #5 Input --> H9 #5 Output --> Aura Effects Loop Return --> FOH. 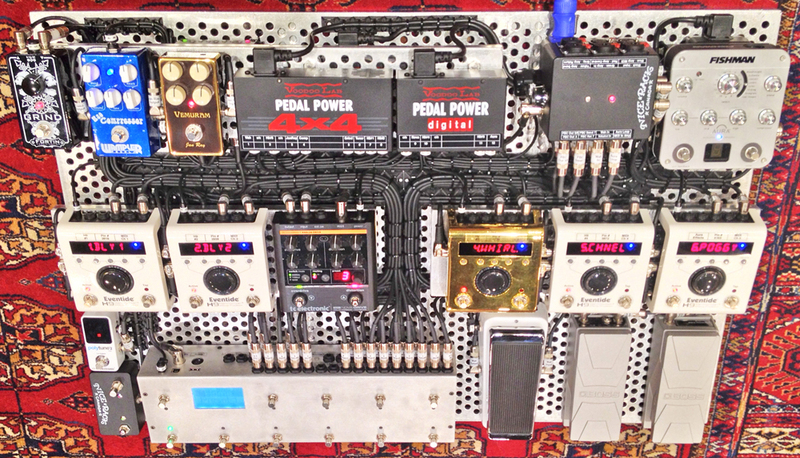 The system is powered by Voodoo Lab's Pedal Power 4x4 and 2x Pedal Power Digital. Last edited by Vegas on Sun Jun 11, 2017 9:30 am, edited 1 time in total. Is it heavy?? need a fork lift to move it? ?